The college grew by donation of 5 acres (2.0 ha) on the south in 1886 and purchase, enabled by donation of C.J.A. Ericson, of 10-12 acres to the north in 1899. Augustana ranks among the top 40 U.S. liberal arts colleges in the sciences, based on the number of graduates earning Ph.D.s. Students accepted to Augustana typically rank in the top 30% of their high school classes. The middle 50 percent of enrolled students for the class of 2012 scored 24-29 on the ACT, well above the national averages. 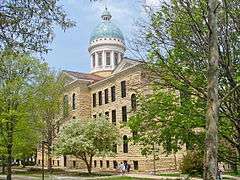 Augustana College is considered highly selective. 73% of Augustana students graduate in four years and 78% graduate in six years. Augustana has five traditional residence halls: Andreen Hall, Erickson Residence Center, Seminary Hall, Swanson Commons, and Westerlin Residence Center. All five of these residence halls are coeducational. The majority of first-year and sophomore-year students typically reside in one of these five residence halls. For upperclassmen, Augustana also offers Transitional Living Areas (TLAs), apartment-like complexes or traditional off-campus houses administered by the college's Office of Residential Life, in which Augustana students live. The school takes care of basic maintenance in these areas, some of which are House on the Hill, Naeseth, and Arbaugh Apartments. These areas usually have 2-6 students who share a bathroom, a kitchen, and other living spaces. Augustana has a local Greek system, which includes seven sororities Chi Alpha Pi (CAP), Chi Omega Gamma (COG), Delta Chi Theta (Delta Chi), Phi Rho, Sigma Kappa Tau (KT), Sigma Pi Delta (Speed), and Zeta Phi Kappa (Zetas) and seven fraternities Alpha Sigma Xi (Alpha Sig), Beta Omega Sigma (BOS), Delta Omega Nu (DON), Gamma Alpha Beta (GAB), Omicron Sigma Omicron (OZO), Phi Omega Phi (Poobah), and Rho Nu Delta (Roundels). Augustana has many other organizations, including a chapter of MENC: The National Association for Music Education, a National Band Association chapter, American Choral Directors Association (ACDA), Paintball Team (NCPA), American String Teachers Association (ASTA), Psychology Club, Business Club, DDR Club, Anime Club, Asian Student Organization (ASO), Ladies of Vital Essence (L.O.V.E. ), The Order of the Phoenix, Martial Arts Club, and Viking Pups, a club dedicated to training service dogs on campus. The Augustana Vikings compete in the NCAA Division III College Conference of Illinois and Wisconsin (CCIW). The Vikings compete in a combined total of 22 male and female team sports, and five out of seven students compete in some form of varsity, club, or intramural sport. Between 1983 and 1986, the Augustana College football team won four consecutive Division III national championships under Coach Bob Reade. Coach Reade's overall winning percentage of 87% is second only to Larry Kehres and Knute Rockne on the all-time list. Augustana College was a member of the Illinois Intercollegiate Athletic Conference from 1912-1937. Current varsity sports include: baseball, basketball (m/w), cross country (m/w), football, golf (m/w), lacrosse (m/w), soccer (m/w), softball, swimming (m/w), tennis (m/w), track & field (m/w), volleyball, wrestling. Lane Evans (1974) - former US Congressman (Illinois 17th District). William R. Hammer - paleontologist who found the first dinosaur, Cryolophosaurus, in Antarctica. The Fritiof M. Fryxell Chair in Geology. ↑ "Mission and history". augustana.edu. Retrieved 24 August 2015. ↑ As of FY 2012. "U.S. and Canadian Institutions Listed by Fiscal Year 2012 Endowment Market Value and Percentage Change* in Endowment Market Value from FY 2011 to FY 2012" (PDF). 2012 NACUBO-Commonfund Study of Endowments. National Association of College and University Business Officers. Archived (PDF) from the original on 16 February 2013. Retrieved February 16, 2013. ↑ "An Augustana Campus History: 1900-1929". Augustana College. Retrieved 27 June 2016. ↑ "College Advice". princetonreview.com. Retrieved 24 August 2015. ↑ "Old Main, Augustana College, 3600 7th Avenue". City of Rock Island. Retrieved 2011-03-29. ↑ "Hansons donate $8 million to name Science Building". augustana.edu. Retrieved 24 August 2015. ↑ "Science Building fast facts". augustana.edu. Retrieved 24 August 2015. ↑ "Our Residence Halls". augustana.edu. Retrieved 24 August 2015. ↑ "Fryxell Geology Museum". Augustana College. Retrieved 8 December 2015. ↑ "Fabulous Fryxell". KWQC.com. January 30, 2015. Retrieved 8 December 2015. 1 2 "Student Groups". augustana.edu. Retrieved 24 August 2015. ↑ Augustana College - Greek Life Archived May 28, 2010, at the Wayback Machine. 1 2 "The Official Athletic Website of Augustana College". augustana.edu. Retrieved 24 August 2015. ↑ "Ken Anderson". IMDb. Retrieved October 19, 2012. ↑ "EVANS, Lane Allen, (1951 - )". Biographical Directory of the United States Congress. Retrieved October 19, 2012. ↑ "Tennessee Governor Don Sundquist". National Governors Association. Retrieved October 19, 2012. ↑ "Daniel C. Tsui - Biographical". nobelprize.org. Retrieved 24 August 2015. ↑ "Louise Nathanson Collection". Augustana College.